Walther is at it again, and this time the name is Creed. Walther has just announced the release of their new Creed pistol chambered in 9mm. Walther has made enormous progress in expanding their market share in the last few years. 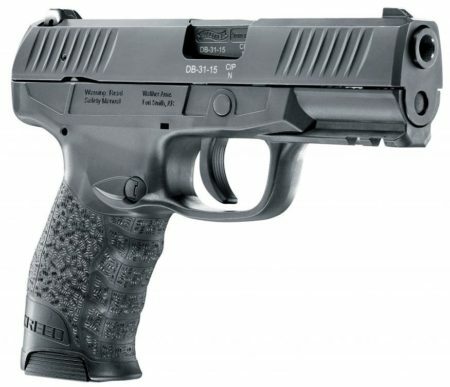 The introduction of the PPQ M2, PPX, and the CCP handguns have really raised the Walther name into the serious discussion for self-defense handguns. The Walther Creed appears to be an upgraded Walther PPX, with smoother lines and features. 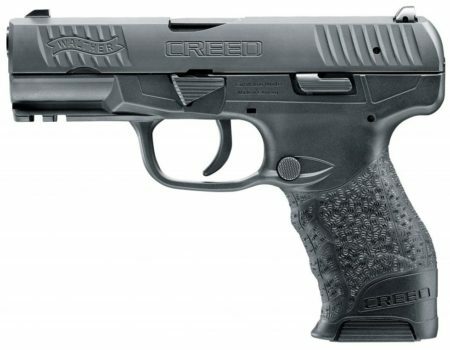 Even if it is simply an upgraded PPX, the new Creed has a nice appearance and is packed with features. For the bargain conscious buyer, the new Creed is an amazing value. Backed by the Walther Lifetime Guarantee, and considering the outstanding ergonomics and shooting ease of recent Walther handguns, the Creed should be a winner. Walther has made incredible firearms recently. Walther chose “Creed” as the name of their new firearm, even marketing its definition: “A set of fundamental beliefs.” With that in mind, it would reason the Creed has the most fundamental beliefs of Walther about the features that make a good yet affordable handgun. 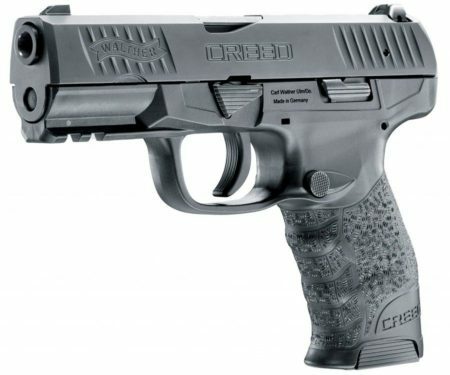 Walther’s advertisement for the Creed claims the features include superior ergonomics, excellence in trigger design, and unparalleled accuracy, quality and reliability. The German manufacturer has been very impressive in recent years. Let’s examine the Creed and see if it passes muster. 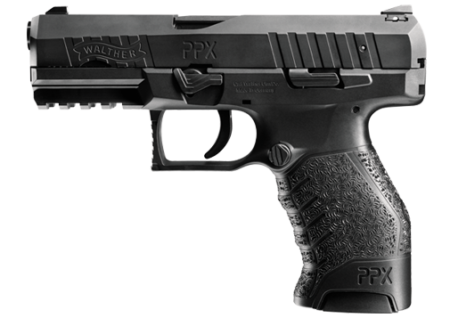 The new 9mm Walther Creed does have similarities to the PPX. The Walther PPX was more blocky and sharp-edged in appearance. 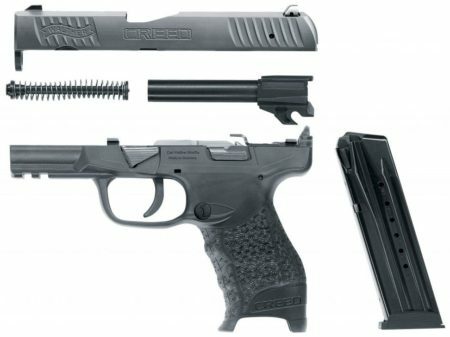 The Creed comes with a polymer frame with the standard modern Walther grip that fans have called the best grip on the market. The grip is mildly textured on all sides and there are three subtle finger grooves. Not everyone appreciates finger grooves, and these seem to be a compromise balance. Enough finger groove surface to help with grip control for those who prefer them, yet subtle enough that they may not be cumbersome to those who do not. The frame comes with a two slot Picatinny rail for mounting lights or lasers to the shooter’s desire, instead of the four slots on the PPX. The trigger guard is rounded like traditional handguns, while the PPX had a squared-off trigger guard like several newer handguns. The Tenifer coated slide is topped off with 3-dot sights. The slide is stainless steel with serrations on the front and rear. These serrations are slightly more subdued and have a nicer appearance than the PPX serrations. The slide and all metal parts have a TENIFER® coating for superior scratch and corrosion resistance. The slide coating gives the Creed a matte black appearance. I imagine the Tenifer being used is slightly different from the old GlockTenifer that has cyanide as a byproduct. That byproduct caused Glock to change its coating a few years ago, though I believe they still use a Tenifer made coating that does not have cyanide as a byproduct. Ambidextrous magazine release and slide lock lever are very beneficial for left-handed shooters. The Walther Creed comes with “ambidextrous” magazine release button and slide lock lever. The controls are not truly ambidextrous, but are instead interchangeable. The ability for left-handed shooters to quickly align the firearm for their needs is a very nice features. What would be even better is if the Creed actually had ambidextrous controls. Both controls are slim enough to avoid any problems with proper grip, and the true ambidextrous controls are great for combat shooting. The Creed features a pre-cocked double-action trigger system with a bobbed hammer to ensure a no-snag draw, particularly from concealment. This Walther trigger system provides the shooter with a light and smooth trigger pull, remaining consistent on every shot. Low profile steel 3-dot sights finish off the Creed’s feature list. The Walther Creed breaks down with the use of a takedown lever. Tenifer coating on all metal components. We have been very impressed with recent Walther productions. The Walther Legendary Lifetime Limited Warranty gives you absolute confidence in your decision when you purchase a WALTHER. With WALTHER, you can rely on the precision of German engineering and the dependability of an American guarantee. Our warranty provides unwavering support for your new firearm and continues for the lifecycle of the product as long as the company manufactures and supports it. If you purchase a WALTHER firearm, it carries its Legendary Warranty regardless of whether or not you are the original purchaser. This Warranty covers WALTHER centerfire and rimfire firearms produced after 1993 only and does not apply to antique, limited edition or custom firearms. We have been very impressed with the Walther PPQ M2, the PPX, and even the CCP though its SOFTCOIL recoil reduction system wasn’t quite as successful as we had hoped. The ergonomics of these newer Walther pistols can compete with the best on the market. The Walther trigger is smooth with a definite crisp break, whether the shooter chooses a hammer-fired pistol or a striker-fired one. Accuracy with the Walther handguns has been very good, and the capacity meets or exceeds most competitors. The 3-dot sighting system on the Creed is a nice, basic set of sights. For a budget handgun I think Walther did a good job of making the Creed ready to shoot out of the box. However, if the shooter plans on using their Creed for self-defense adding a good set of illuminated sights would be a top priority. So far I like what Walther has done with the Creed, even if it is just a rebranded and newer looking PPX. Overall I like these new Walther pistols very much, and from what I’ve seen I’m going to like the Creed just as well.